Koosmik is a mobile application allowing users to hold and manage an electronic wallet, make free and instant transfers between friends, cashless payments in shops, deposits/withdrawals from a network of agents, and pay bills with an agent or through the app. Other features planned for this year include a money pot feature tailored to community solidarities and a highly rewarding referral-based loyalty programme. We also aim to propose preferred access to credit and interest-bearing savings through partnerships with local banks. I spoke Matthieu Crance, the fintech’s COO & Managing Director of Koosmik Togo, who has been crucial in the development and strategy of the application. This key man has already started discussions with institutional partners in Africa regarding their long-term development and I was told he was the one to interview considering the local experience and next steps. How did you come up with the idea for Koosmik? 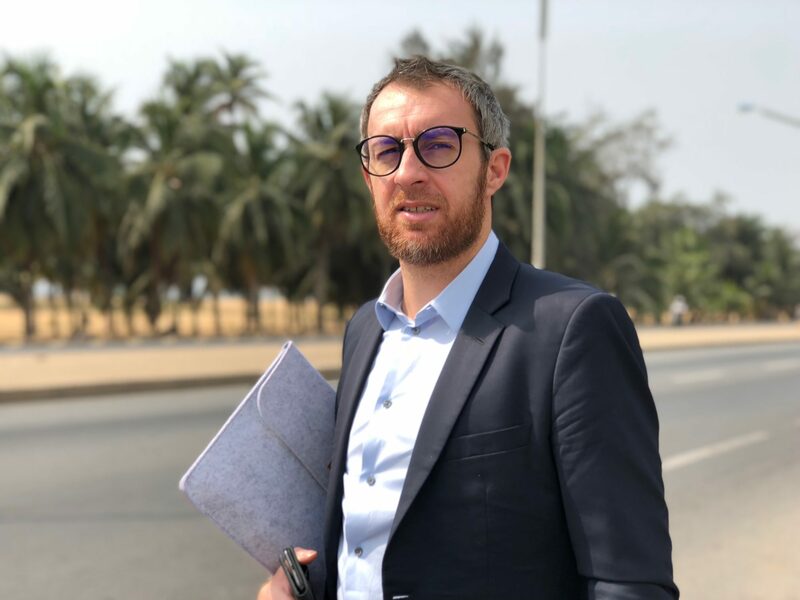 I joined Koosmik back in early 2016, first to assist the initial Founder, Grégoire Yakan, in the design of the right market and financing strategy. At the beginning, our technological product was sophisticated and generalist. The idea was to find the best match between the service that we intended to introduce and the evolution of market demands while keeping the vision and core values of the company. After having conducted an overall market analysis, we confirmed that African markets were more likely to be both fast and mass adopters of next generation mobile wallet solutions. When it comes to introducing a new product, it is all about market timing. In Africa, people are largely unbanked. They remain highly cash dependent. Nevertheless, the digital economy is moving forward at an incredible rate across the continent and is providing the prerequisites for the penetration of mobile-based payment solutions to the mass market. We eventually decided to focus our early go-to-market on Togo where one can enjoy short business channels and an easy access to decision makers. It makes an excellent pilot market to validate our value proposition and prepare a further deployment across French-speaking countries of West Africa. In the African economies, where customs related to money are deeply cash-oriented , are you expecting an easy adoption? A radical change is obviously occurring in this region with the current advent of the digital economy. Going back only 5 years, access to the Net in Africa’s French-speaking countries was scarce and limited to the highest social class. For the rest of the population, it was just inaccessible. Nowadays, most of the people living in urban areas have daily access to mobile connectivity with equal standards to Western countries. The majority surf the web via a smartphone. The use of laptops is not as common as in Western countries. This fast-emerging digital economy is highly mobile-driven. What a revolution! It is creating a bridge between the youth an older generations. It is clear that older generations in Africa will struggle to keep up with this cultural evolution. On the other hand, the younger generations are rapidly evolving with new technologies. Smartphone penetration has risen exponentially in the past two years in Lomé, despite the very low average purchasing power of the population. In this context, mobile banking appears to be a key industry primed for change. By leveraging tech-savvy youths, you increase the chances to foster viral evangelisation and achieve a critical local market traction. It is also key to understand the communities and offer them solutions that encourage social interactions; rewarding peer to peer referrals for instance. Many people solely use their mobiles for communication, the traditional system in African countries can be quite slow and a lot of the time you can’t make transactions unless you have a minimum amount in your bank account. What are you going to do to try and tackle this? Are you targeting a specific class of the population? First of all, it is important to remember that mobile payments have been present across Africa for almost 15 years. Before the arrival of mobile connectivity, phone-based transactions were processed using the USSD technology. These types of solutions, provided by telecom operators only, are now a huge success and have people of progressively come to trust and rely on this method of transferring money. The current emergence of next generation mobile wallets is taking advantage of this previous experience. Now offering a real banking experience through a mobile application including new features like interest-bearing savings, access to credit or money pots; facilitating most daily transactions such remote as utility bill payments. Regarding our go-to-market, we are taking a step by step approach. We consider that we first have to focus our business development and marketing efforts on niche markets; more likely to appreciate this modern solution. Urban areas are therefore our priority. Then, we are committed to invest a lot of efforts to market Koosmik to 15-40 year-olds. Our user experience has been designed in accordance with their needs and expectations. This age bracket represents a large part of the active population and will form the heart of the dynamic class of tomorrow. Our approach does intend to first address the middle-to-high social classes that are very fast adopters of next generation digital solutions. They are highly connected and have a middle to high purchasing power. By a process of social comparison, we expect that, naturally, people from lower social classes will want to follow suit. In this way, Koosmik gradually address a larger panel of the population. To do so, we have designed a tailor-made loyalty programme that rewards our users for their contribution to new user referrals. A lot of the African economy are vulnerable to hackers and fraud, how can you reduce the risk of cybercrime? Indeed security remains a constant priority and an evolving issue, our solution adheres to the highest level of security standards in Europe and America. We have algorithms that are able to detect unusual behaviour on the system allowing us to identify transaction fraud and anomalies from our API. In terms of personal security, we strongly recommend that our users keep their passwords private and use double authentication. Furthermore, user accounts are encrypted and stored on secure external servers. In Europe, the experience has proved that it is quite hard to hack strong passwords and nowadays we have them for everything. Only 10 years ago we used to be scared of sharing data online and paying online. We are optimist that this first digital-friendly African generation will follow the same trend. It takes time to build up trust and it is important that all players of the digital economy in Africa work in the same way to educate people in becoming confident with the daily use of these solutions. You are creating a product to be used by locals in Africa. With regards to your social consciousness and helping the progress of Africa, is the team you’ve hired reflective of the users you aim to acquire? I think this why it is so important to progressively build up a positive pan-African-driven brand . And, as Europeans we have to do more than local players to avoid being perceived as a profit-centric company. As of now, we have 5 local employees in Togo but we are entering an important recruitment phase together with our recent go-to-market. In addition to our operational partners, we are about to hire 50 people over the next two months who will compose our force on the field. Indeed, we need to have a positive social footprint locally. This commitment is wholly aligned with our corporate values. We consider that we will only achieve great success by serving the people with solutions that aid their daily life. We also think that access to payments, enabling savings and credit is any citizen’s given right. Therefore, we have adapted our pricing model to ensure as lower impact as possible for our individual users. We are confident that acquiring a critical user base is more valuable than making high marginal revenue. Our ambition is to eventually participate in educating young dynamic talents, locally, within the team; making them profit from our experience and providing them with the right working environment enabling them to acquire modern skills in the field of digital marketing, IT engineering and so on. Clearly, we think the best way to grow a new generation of young dynamic executives and entrepreneurs is to allow them to evolve in this kind of working environment. We believe that we learn much more on the field facing real business situations than listening to theoretical lectures at school. Not enough people in this region are pushed to think and develop a sense of reflection; such as one experienced in a startup environment. People lack confidence in their own skills and abilities to achieve great things. I think by creating that spirit, at our modest scale, for the local economy of tomorrow, we can encourage them to be more active on the scene and leave a positive footprint. I am very happy to state that in only a few months our employees gained autonomy and self-confidence. In my opinion, these are two key assets needed to be good at your job: Firstly, have to be happy at work, Secondly, you have to feel legitimate and trustworthy. This is what we try to do. Koosmik are currently in a pre-launch phase in Togo and released a private beta to a select number of testers on Monday 14th May. If you want to find out more and meet the team come find them (Matthieu, Greg, Louann & Robin) Between 24th – 26th May in the Africatech zone (J08) at Viva Tech.